In a bowl, combine flaked coconut, graham crumbs and melted butter. Press into bottom of a greased 9″ springform pan. Bake for 10-15 minutes or until crust is golden brown. Cool completely. In a small saucepan, sprinkle gelatin over cold water and let stand for 1 minute. Stir in sugar and cook on low heat until sugar and gelatin are dissolved. Remove from heat and set aside. In a mixing bowl, beat cream cheese until smooth. Gradually beat in gelatin mixture. Add lime juice and zest and beat until blended. Add 1-2 drops of green food colouring. Fold in whipped heavy cream and pour cooled crust. 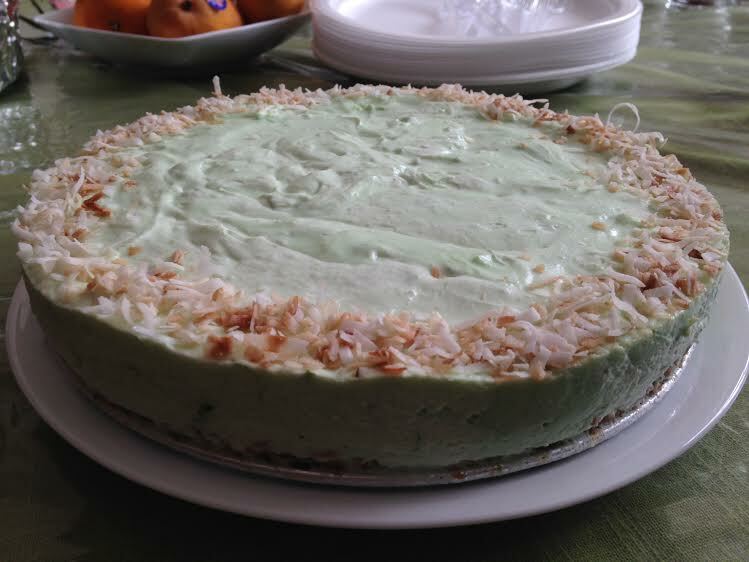 Garnish with toasted coconut and chill cheesecake until ready to serve.